By default, Mail groups together email messages that are part of the same “conversation” (or thread), instead of listing each reply individually. Conversations make it easier to follow a thread and help streamline your Inbox. Tip: It’s easy to turn conversations on or off. In Mail, choose View > Organise by Conversation (a tick shows it’s on). For one conversation: Click the message count in the top message. For all conversations: Choose View > Expand All Conversations. 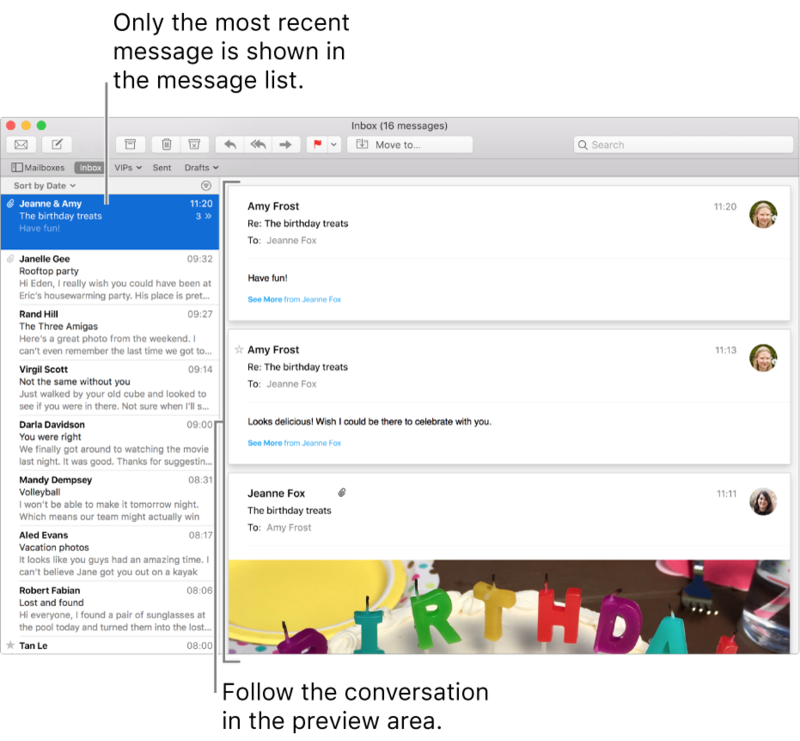 If you don’t want to see all of the emails anymore, choose View > Collapse All Conversations. See the subject line: Scroll to the top of the preview area — the subject line is shown there instead of in each message. You can also click Details in the header area of a message, or look at the subject line in the message list. Step through a conversation: Press Option-Up Arrow or Option-Down Arrow. Show more of a message: If a reply contains the original message but doesn’t show all of it, click the See More link at the bottom of the reply. You can change the order of messages in the preview area. Choose Mail > Preferences, click Viewing, then select or deselect “Show most recent message at the top”. By default, a conversation includes related messages that are in other mailboxes. You can exclude these messages from conversations. Always exclude related messages: Choose Mail > Preferences, click Viewing, then deselect “Include related messages”. Exclude related messages until you quit Mail: Choose View > Hide Related Messages. When you delete a conversation, related messages located in other mailboxes are not deleted. When conversations are turned off and you select one of the messages in the thread, the other messages are highlighted so you can still identify the thread. To change the highlight colour or turn off the highlighting, choose Mail > Preferences, then click Viewing. If you want to see the highlighted messages grouped together in the preview area, choose View > Show Related Messages.